Antioxidants (arginine, glutamine, zic, and Vitamin C) and improve scar formation (maturation). Immune Enhancement and restoration-(arginine, glutamine and whey protein)-to resist infection. Support angiogenesis-(L-arginine)-to improve blood flow for wound profusion. High-protein-nitrogen supplementation-(7g of arginine, 7g of glutamine, and 10g of whey protein)-to more easily provide for the increased protein and nitrogen needs for all steps in wound healing. Bimuno Prebiotic-clinically proven to have a positive effect on the immune response by significantly improving the healthful balance of gut microflora. When calculating protein needs, grams of individual amino acids such as arginine and glutamine are not included in total protein intake. Arginine and glutamine are given in addition to total protein needs and work in conjunction with protein for healing. The National Pressure Ulcer Advisory Panel (NPUAP) recommends 1.2 to 1.5 grams of protein per kg of body weight for wound healing. Larger draining wounds may require higher levels, up to 2.0g of protein per kg of body weight to offset protein losses from wound exudate. 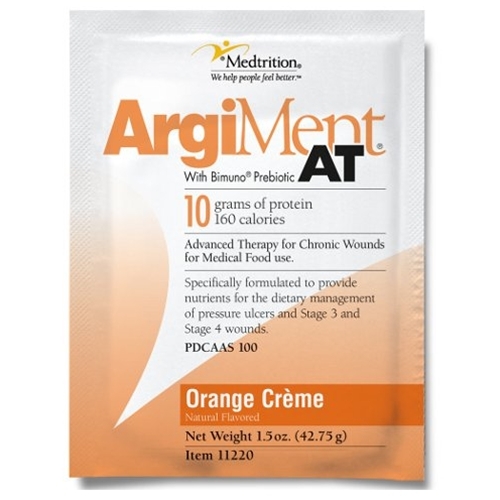 ArgiMent AT provides 10 grams of high-biological whey protein per serving in combination with 7 grams of arginine (13.5 N2 Eq) and 7 grams of glutamine (8.5 N2 Eq), yielding a high-protein-nitrogen intervention to meet the increased nitrogen needs associated with chronic, non-healing wounds. Indications: Typically used to provide advanced nutritional therapy for pressure ulcers and other wounds that have responded slowly to standard nutritional therapies for wound healing. Low sugar and appropriate for carbohydrate-controlled diets. Can be thickened to comply with Dysphagia diet restrictions.